create all-natural pet foods and treats you can count on. Think Fresh… Forget the Can! Stewart’s healthy dog food offers the premium quality your best friend deserves. Our Raw Naturals™ Fresh-to-Home recipes provide complete and balanced nutrition with all the benefits of a raw diet. Freeze dried dog food locks in freshness and vital nutrients, making it delicious and nutritious. And the food is shelf stable, lightweight and available in nuggets or patties. Inspired by dogs’ natural, protein-rich diets, we created Raw Naturals Fresh-to-Home recipes to give dogs energy and vigor. Single- or limited-source proteins makes it easy to meet the needs of dogs with allergies or food sensitivities. Watch your dog thrive on nutrient-dense food that supports health and wellness. 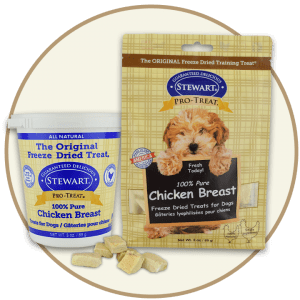 Stewart’s dog treats are the original freeze dried treat. We take the power of raw natural ingredients fresh from the farm and use our innovative freeze dried process to lock in freshness. When it comes to treats, we know that peace of mind is important. Rest assured that our quality standards with USDA-certified ingredients ensure that you’re feeding safe dog treats to your fur family. Our treats are locally sourced and manufactured in the heart of the Midwest under our own roof, to use with confidence under yours. Our promise to you is love and excitement in every bite. 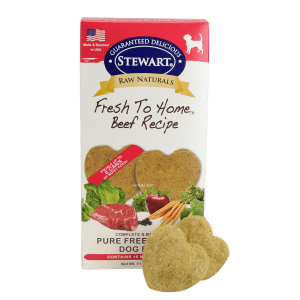 Stewart’s Raw Naturals Pro-Treats are specialty training treats for dogs made for training and health benefits. Our all-natural dog treats are made in the USA without additives or preservatives in our small-batch facility in the heart of the Midwest. 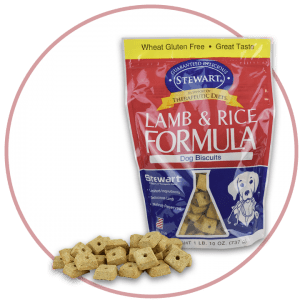 Stewart’s Therapeutic Diets were developed by an innovative veterinarian in response to your best friend being on a special diet. As concerned pet parents ourselves, we understand wanting to give them a special treat, and with these functional treats, you can do just that. 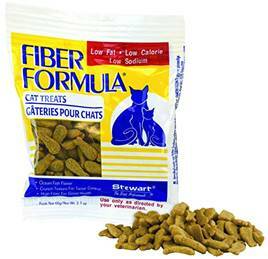 Even the most fickle of felines will come running for these crazy delicious cat treats. 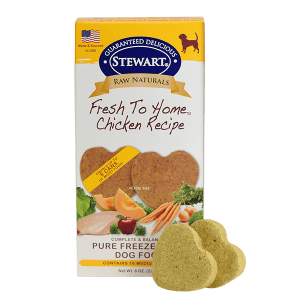 For over 45 years, Stewart has been leading pet food innovation to seal in freshness with all natural ingredients in a guaranteed delicious way. Stewart healthy cat treats contain only fresh, wholesome ingredients. You can rest assured, they are gluten free, grain free, additive free and packed full of lean protein and nutrition. Love and excitement in every bite is our promise to you. We gently process our premium ingredients in the heart of the Midwest. With safety as our top priority, you can feel confident in feeding our healthy, all-natural cat treats to your fur family. 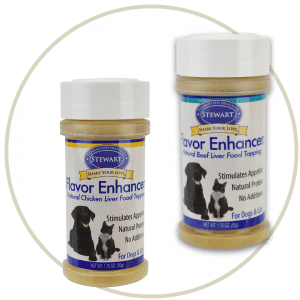 Stewart’s Flavor Enhancer’s were made to help entice your pet to eat. Made with 100% pure beef liver or 100% pure chicken liver and no artificial preservatives, your pet will be begging for food in no time.